The Lord has promised us shepherding, not perfect understanding of where He is leading or why He is taking us there. The Lord has promised us what we need, not what might be on our wish list. The Lord has promised us green meadows where we can find rest, not a life that doesn’t require labor in His fields. The Lord has promised us peaceful streams where we can quiet our hearts, not the absence of deep waters to overcome in our walk of faith. 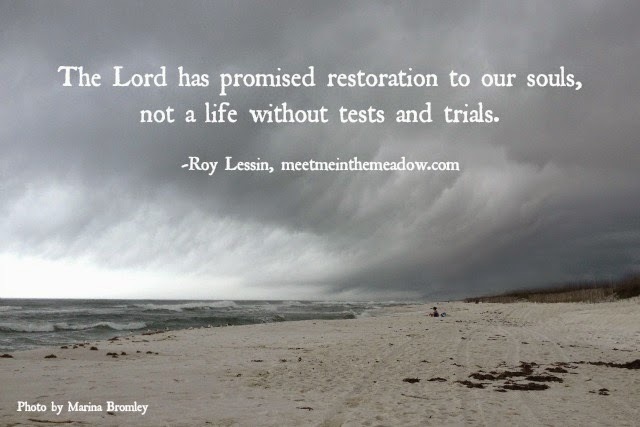 The Lord has promised restoration to our souls, not a life without tests and trials. The Lord has promised to lead us to the places that will honor Him the most, not to the places that will make us look good. The Lord has promised to walk with us through the valley, not take us on paths that only lead to the mountain tops. The Lord has promised us victory in the face of the enemy, not the absence of spiritual warfare. I will live in the house of the LORD forever. Amen. Beautiful. He never abandons us. Always with us.